Well, good Monday morning (almost afternoon!) to you! 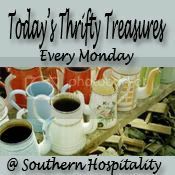 We started swimming lessons this week, so I'm a bit behind, but I'm joining Rhoda's thrifty treasures party! 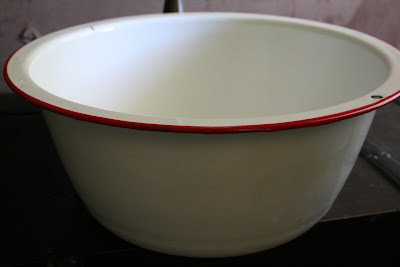 a big red and white enamelware bowl. I love this and can just see big juicy slices of watermelon in it this summer. Does it all look like junk to you? Let's think potential here.... :) I'll show you the transformations eventually. Love it all! I want some trays like that :) Yay for you! it all looks good to me, I really love that little lamp! It doesn't look like junk at all! Looks like loads of fun! those are some great finds! I'm seeing lots of potential--such as scrapbook paper modge podged on the trays. Oh, and I'm almost certain Pottery Barn carries a clock that looks like that. I would see if it could be fixed! GREAT JUNK! 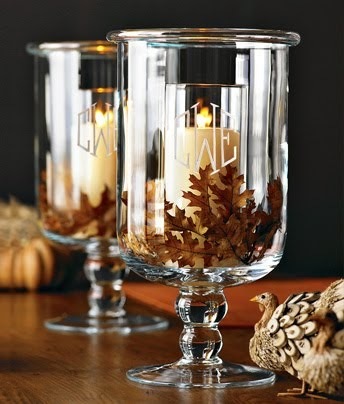 However, you will make it look like it came from the most expensive shops...I love all this! I love your treasures! Especially love the lamp. 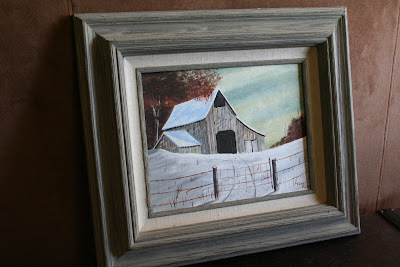 Will you paint it or leave it as is? Oh, I can't wait to see what you do with all those great finds! The clock looks EXACTLY like my Pottery Barn clock that I paid over $50 for! I would keep it for the look...besides it ticks LOUDLY! Love it all! You find such great things!!! :) Good job! Yes, I also can't wait to see what you do with all your finds!!! You are so creative! Great finds. I'm jealous about that bowl. It looks perfect for some cut-up watermelon or strawberries. Trays for .50??? Fantastic. It doesn't look like junk to me..I love that clock, that's a keeper. doesn't look like junk to me just some great finds! i can see the potential in that lamp, great lines! too bad the clock doesn't work, but you're right it will look great for decoration. Your clock will be correct twice a day! Melissa - You found some great treasures. When I find lamps they don't have a shade or, I get home and find the shade is not for that lamp. I usually then end up buying a new one. Lowe's is the best place for them. Thanks for sharing everything with us. The lamp is sweet. 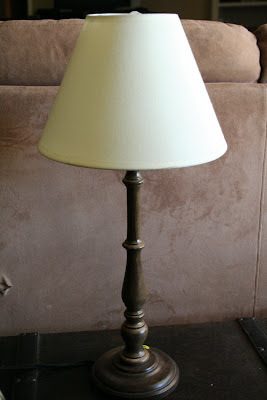 Most of the lamps that I find are the chunkier wooden lamps and I paint them white or black. But, your wooden lamp is slender and shapely...I like it as it is! I really like that clock. I would set it at 11:11 and make a wish on it every day! Love the clock and the enamel bowl. What great finds. I am looking forward to the transformations, especially that cute little lamp. Junk? Heck no, those look like treasures to me! LOVE that bowl. Nope, it definitely doesn't look like junk to me! I am totally jealous of your lamp, I have been wanting one like that for awhile. Can't wait to see all your transformations! Oh, yeah! I see potential in everything. Love that enamelware bowl too, really cute. You did good this week, thanks for joining the party. The lamp is so cute, and I like the clock too, but I love the bowl! Love love those trays. I agree with Alison. 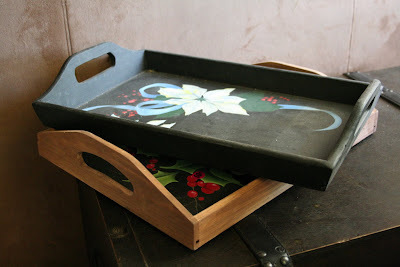 Mod podge those trays, add some classic literature, and you're good to go. =) Great finds! Awesome finds! I can't wait to see your transformations! What wonderful treasures. I love that little clock. So cute! 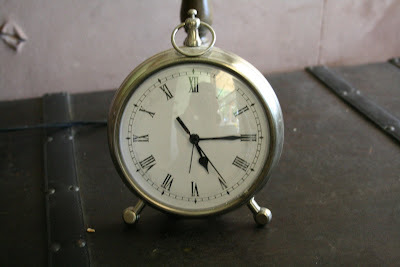 The clock you have posted that doesn't work looks exactly like the one I recently purchased at potery barn. 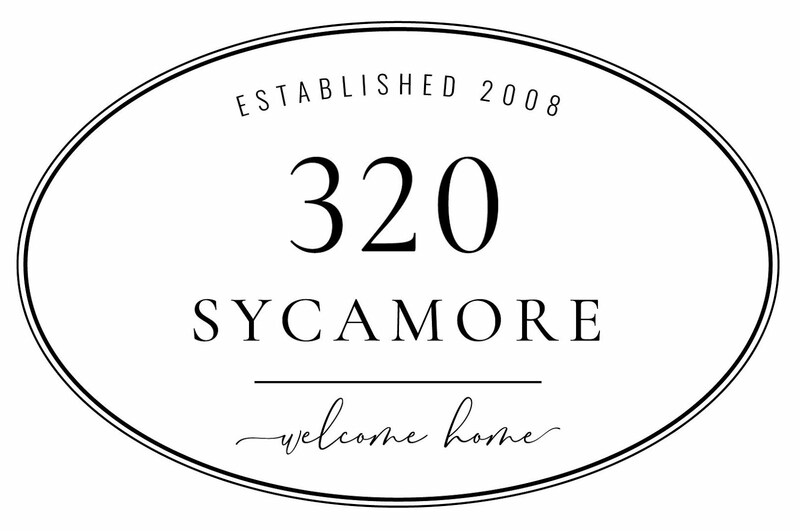 You may want to take it there and see if they can help you? Junk? No way! Not for you, especially! :) I'm getting a little crazy for enamelware lately, chips and all. Huge potential here! Love the clock... even if it doesn't work. $2 lamp... a steal! Here's something funny...I saw the exact same enamleware bowl out yardsaling this weekend too. It even had that same hole in the rim as well. I debated so long whether to buy it or not, and at $4, decided not to. I'm sort of wishing I had though. great finds, love the enamel bowl. You got some good junk! Can't wait to see what it becomes!